A team of former Manchester United footballers will be coming to Hastings later this year, according to Hastings United Football Club’s website. 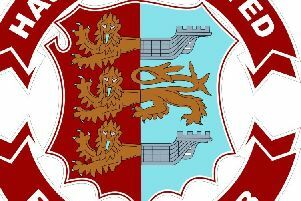 As reported by www.hastingsunited.com, Manchester United Legends will take on Hastings United Legends at The Pilot Field on Sunday September 8. Match tickets are priced at £10 for adults, £5 for under-18s, £25 for a family of four (two adults and two children under 16) and £50 for VIP (meet and greet). VIP tickets will include the after party at Hastings United Sports & Social Club, where ticket holders will be invited to partake in a free buffet, meet and greet the players, and be eligible to bid on auction items. These tickets are limited to 100 and will be offered on a first come, first served basis. Tickets will go on sale at 10am on Monday April 15, and will be available from Hastings United FC, Springfield Dental Care, Conquest Hospital flower shop, Hastings Tourist Information Centre, M&W Property Sales & Lettings and SuperStitch 86. Tickets purchased from Hastings Tourist Information Centre will be subject to a 50p surcharge. News of players taking part will be announced in due course.